And I gotta admit, I thought sailboat racing was part of my distant past, like smoking, skateboarding, Foreigner, and doing stair-rolls at parties (don’t ask). But wa da ya know, since I’ve dusted off the ol’ Sunfish, and experienced my first Sunfish race in about 100 years, I’m literally chomping at the bit to get out there and mix it up again. Or maybe it’s simply because I can share all this seaside Sunfish wonderfulness with my little one who intuitively seems to know his way around boats and the sea. What do you think we’re looking at? Mommy probably. 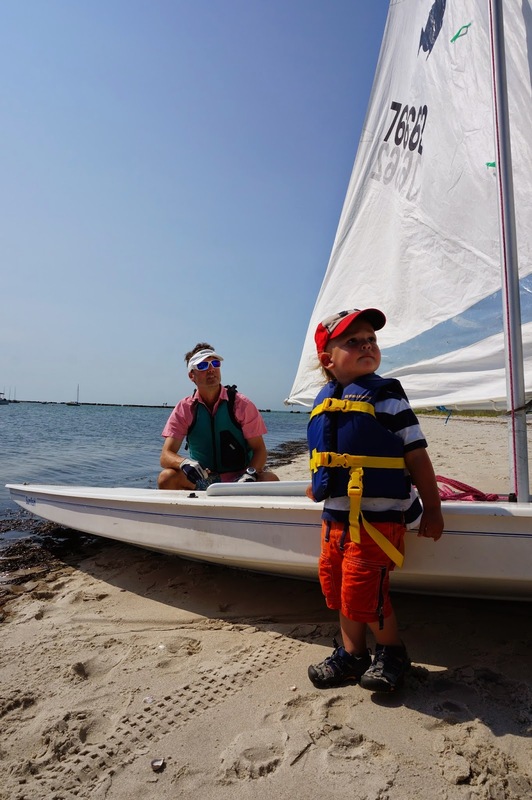 He came down to the beach to help me get ready to sail, wowed the competition with his cuteness, and then was a little mad when he got left on the shore with Mommy when I finally pushed off with the rest of the fleet. Look at that sky. And the sand. And the beach grass. 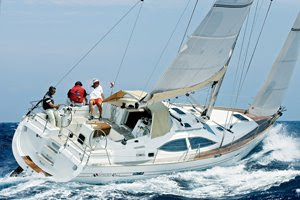 And the PFDs. Doesn’t get more summery than that, now does it? …Well, it’s August 19th, 2014, and I do tend to blog about shiny, happy preppie things all the time, but I’m hardly immune to the events of the day. And while real, painful, horrible violence is happening in Gaza, and Ukraine, and Iraq (an American photojournalist in Iraq was “executed” on TV by the group calling itself “The Islamic State” just today), and in poor places all over the world, what’s going on in Ferguson, Missouri, makes me mad, sad, and grateful, and even hopeful all at the same time. And I hope, check that, my plan—at least in our little family—is that our little boy will grow up in a world (or at least a household, and yes, a preppie household) where love is more powerful than hate. And where peace and connection and communication and humor is more powerful than violence. And where each person feels just a little bit more for the plight of the other guy than we do now. Peace begins in our hearts. In each of our hearts. And if we can all just find a little peace in our hearts anything is possible. And as the protests in Ferguson, Missouri, go into their tenth day, and yet another black man in his 20s was shot in St. Louis County by the police, Captain Ron Johnson of the Missouri Highway Patrol still makes me feel like good things are possible, even in a world and a country where young kids gets shot in the street by police ALL THE TIME. Please watch the whole video below. And then go give your kids or your wife or your parents or a friend a hug. And then forgive if you can.